A major portion of the 2014 Graystone Christmas Offering will go toward the down payment of a new 10,000 square foot Student and Children’s Building at our Graystone Ozora Campus. For a long time now we have been out of children’s space on Sunday mornings, and our middle schoolers are busting at the seams on Wednesday nights. 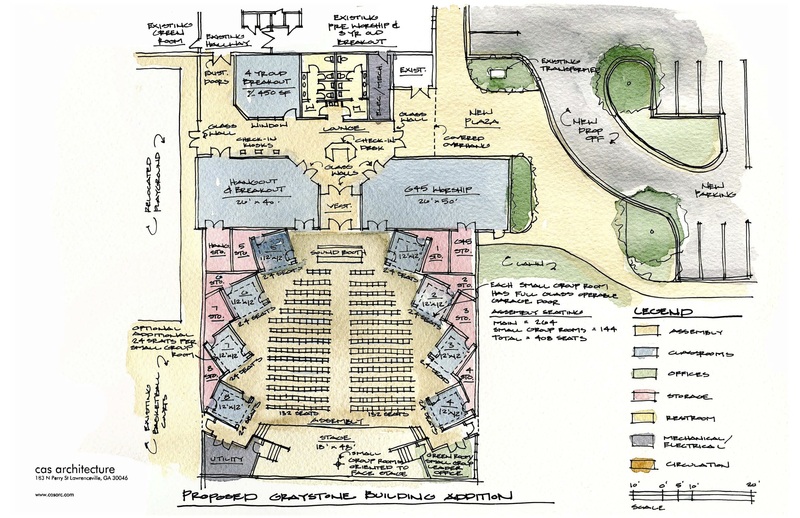 Our student and children’s ministry staff are designing the prefect space for our Graystone Students and Graystone Kids. Not only will the new building allow us to reach more students/kids for Christ, but it will be better environments for our Graystone Students/Kids to grow spiritually. We are still in the early stages of design but the above drawing will give you an idea of the layout of the new building. It will be connected to the back our our existing building. So when you walk down the children’s hallway and out the back doors, you will no longer be walking outside but into the new Student & Children’s Building. The new building will take up the existing playground and part of the infield of the ball field. We will be flipping the ball field and repositioning the backstop in the current deep center field. After construction, we will be removing the modular buildings which will be replaced with a new playground and picnic area. There will also be a drop off lane for the new building and hopefully, some additional paved parking. We are pretty excited about that new building and how God will use it to reach more students and children for Christ. If you are a parent or a grandparent, I really want to encourage you to make a significant gift to this year’s Christmas Offering. You will not only be giving to God, but you will be investing in your child’s spiritual growth and development. If all goes as planned (design, permits, getting on sewer, financing, etc. ), we hope to break ground in the Fall of 2015.